These individual cottages come with all the conveniences of home including a full kitchen plus a washer and dryer in every unit. Summer Cottages are raised beach homes, with parking underneath for your convenience. Only a short distance to the white sandy beaches and Blue Atlantic or you could just relax by your choice of pools and enjoy the beautifully landscaped grounds. Wi-Fi, free long distance and digital TV converter is a real plus. Summer Cottages are centrally located in the northern end of Myrtle Beach close to major attractions, shopping, dining, golf, plus much more. "This property is well maintained , nicely decorated , very comfortable beds , and well equipped . Have rented three years looking forward to 2019 stay "
"This cottage is well decorated , very well equipped , This is our third year here . I would recommend this cottage to anyone . Simply put "there is nothing to complain about""
"We came down for a little two day trip to get away from the home. Entire family enjoyed themselves and the house was in the perfect location. Close to all our favorite eating spots, also just a quick walk to the beach. Not to mention plenty of towels and wash rags was provided for each room. Also they provide security, which was a big plus. Don't hesitate when it comes to picking this cottage for a nice get away." "Property is excellent . Our second year there and will be back next year . We have had no issue with the property however I can state the management company will resolve any with efficiency (info from friends who have rented from the same rental company). The only complaint I have is that rental company seems reluctant to answer emails One example is I had to call to pay my rental fee. " "Very comfortable furniture and beds, well supplied with dishes, glasses, etc. It would be nice to have the wash machine updated - it does and did cause snags "pulls" on shirts and sweaters. While the bathrooms were clean, the furniture could have used a good dusting and there were sunflower seeds under the tables and on the front porch. We had to vaccum when first getting there. " "Great location - right down the street from the beach. Condo is quite spacious with 3 bedrooms and the best stocked kitchen I've ever encountered (place settings for 12 and every kind of pan/gadget you could want). Only downside was the rental property provides horrid sheets (they were once upon a time white, but washed so many times they were splotchy yellow and stained still in places - plus they didn't fit the bed - giving you two regular size pillow cases for a king size pillow to put on both sides is just tacky)... plus if I'm paying extra for the sheets I expect them to be put on the bed, not have to do that myself. Plus they give you only two rolls of toilet paper for a whole week for the entire condo - why bother at all? The condo and location are perfect - why cheapen it with a substandard rental management company. " "More than we expected I have no complaint Not one. Tyrone is an excellent manager. Helpfull, considerate.Property was spotless , well kept . We booked for next year . " "The house is at a great location. I especially appreciate the full sized washer and dryer and having all the rooms on one floor. There are plenty of dishes and cookware available and the kitchen was well equipped. The only issue we had was the fact that the air conditioner broke before we arrived and it was about 92 degrees in the house when we got there. We called the management company and someone was there to fix the unit within 20 minutes. We realize, however, that this was a problem that could and will happen anywhere especially in the hot summer months. We were very happy with how the management company resolved the issue so quickly. This was the second time we stayed at this property and we will certainly use it again in the future. 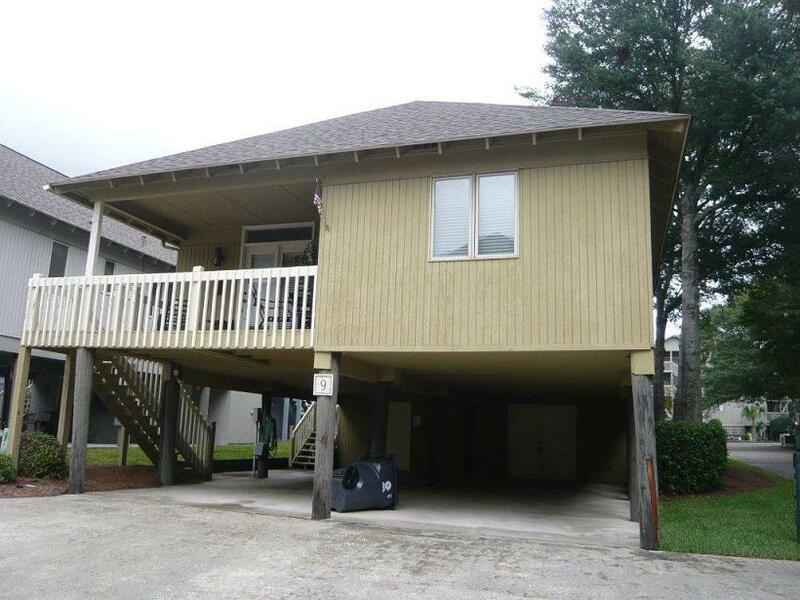 The property is located close to the beach and also close to both the Kroger's store and Walmart which makes it easy to pick things up when you need them. It is also great having the parking facilities under cover. It makes it much easier to load and unload the car without having to be in either the hot sun or the pouring rain. There is also a pool which is very close to the house that the kids enjoyed. It is hard to find things wrong with this property aside from wishing there was at least one more bathroom. Two full baths, both attached to the respective bedrooms, is not always enough with a larger number of people in the house. Overall I would recommend this house to my family and friends without any hesitation. " "Cottage was very nice, and clean. We enjoyed our vacation time in the cottage. Neighborhood was very nice as well as neighbors themselves. For the most part the cottage was stocked with some kitchenware but could use some more. Beach essentials weren't the greatest but was still nice to have." "Everything was wonderful during the week. Our family had a very good time. Only problem was the door hinge on the double full bedroom. The door hinge needed fixed. Next year will be our third year staying here in this cottage." "We had a wonderful stay. It was located just a short walking distance to the beach. Enjoyed that it was off the main road and quiet. The house was nice and included everything we needed. " "Overall it was a nice vacation. Location is a very short walk to the beach. Even though there were a couple no smoking signs in the unit it definitely smelled like smoke the whole week. " "This was the perfect location, a short walk to the beach, yet peaceful after leaving it. I personally would like to thank the owners of this property for opening their home to us. It is decorated beautifully with all the comforts of home. We respected using it as if it were our own home. Thank You again! I would absolutely rent this again!" "The overall experience was wonderful, if there was any problem it was the pool it needed cleaning. "it was very comforble and kid friendly." "We enjoyed our stay at the cottage. It is in a perfect location and the home is very nice. The property management company had great communication and did a great job." "Was generally happy, except for the smell. It was supposed to be a non-smoking unit, but smelled like someone had smoked there and was covered up with a lysol smell. Rental company apologized and gave us coupons for free pizzas and said we would receive $160 check as compensation." "It was the first time staying here and workin with the rental company and they were nice but it was kind of disappointing it took us 2 hours to get into the place. It was also disappointing that I had e-mailed the company twice before our check in day to make sure of something and never got a response, it's kinda strange that as soon as I was done paying things off my e-mails stopped being answered. Also would have been nice to know that of you run the toaster and microwave at the same time you will blow a fuse haha but oh we'll it was a nice place and nice area very close to the beach I found the beds comfy. But with the master bedroom the remote did not work with the TV. " "The rental was very clean. The beds were very comfortable. It was a short walk to the beach.The rental company was very friendly. I recommend this place to anyone. " "The cottage was very nice, The pictures did not do it justice. it was much nicer in person. The staff was just as nice and helpful as they could be. I will defintly be back next year. I would recommend anyone to stay here!" "HAD GROUP OF 24 and a couple people had same last 4 digits on AMEX, caused some confusion. Also some turnover in personel"
"No hassle, nice place, good location. Thanks for renting to us."